Hunter's Heart is currently taking reservations for 2019 BB x Boo litter of Brittany Spaniel puppies. These parents have consistently produced outstanding puppies in past litters: for hunters, scent detection dogs, partners for dogsports, and companions for families that enjoy an active lifestyle. Pups should be ready to go to their new homes mid-April, 2019. 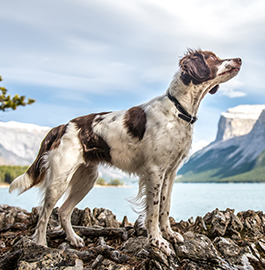 Dr. Carla Simon has bred and trained hunting dogs for Hunter’s Heart since 1999, as featured in the Pointing Dog Journal, Dogs in Canada, Clean Run and American Brittany magazines. She's a professional scent detection trainer, instructor, Certifying Official and CKC Scent Detection Council Representative. She is a Contributing Editor for the American Brittany Magazine, and a sought-after speaker who drew a sold-out crowd of more than 600 at UBC’s Chan Centre for the Performing Arts. Her Brittanys are purpose-bred, athletic working dogs from field lines. Owners report strong desire to hunt, intense, stylish points, avid retrieves on land and in water, smooth movement and sweet temperament. In addition to field and scent titles, Hunter’s Heart Brittanys have won gold at AAC Agility Championships, Best of Breed at the National Brittany Specialty, and achieved numerous top 5 national rankings in agility, conformation and obedience. If you're interested in reserving a puppy, please complete the screening form. Puppies are generally all reserved before the litter is born, so please reserve early to avoid disappointment. HuntersHeart Black Betty NC NI NE PTE AGNJ (BB, the liver female in this photo) is an avid hunter and bed bug detection dog. Around the house, she's a gentle girl who likes snuggling, and is an excellent mother when raising pups. BB's hips have been PennHip certified and her eyes have been CERF certified. BB won High in Trial at her first weekend of UKC Scent Detection competition (2018). She was Canada's #4 Agility Brittany and won National High in Trial Agility Brittany (CKC 2017). BB is the daughter of Canada's #3 Agility Brittany, Vite, (CH HuntersHeart Prairiestorm Vite FDJ MSCDC AGDC ADC AGNJV HPN NAC, CKC 2015, #1 Agility Brittany CKC 2016) X USA National Amateur Gun Dog Champion AFC DC CH GCH Triumphant's To Hot To Handle JH. CH HuntersHeart RedDevil Fantome FDJ CGN AN SGDC SDS-SP TOG MN EV EC EI (Boo, the orange male in this photo), is exceptionally friendly and outgoing. He's eager to please as both a bed bug detection dog, and bird dog. Boo's elbows and patellae are normal and he's been certified OFA Good, CERF (2014). Boo is a bed bug detection dog, hunter, and multi-High in Trial winner. 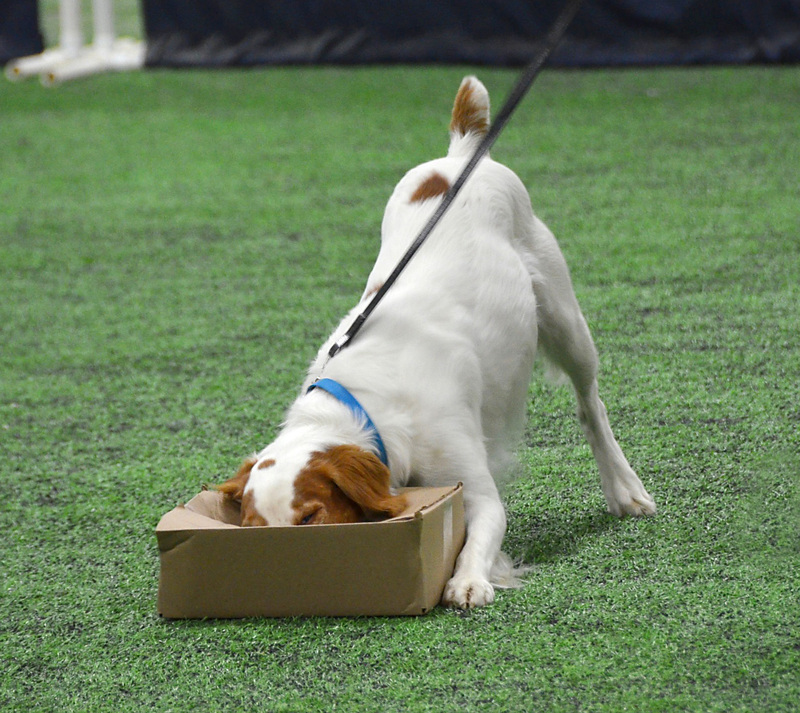 For example, in Elite UKC Nosework, he searched an Exterior area over 3000 square feet, to find 3 hides in under 38 seconds (Calgary, June 2018). In 2017, Boo was Canada's #2 Agility Brittany (CKC) and a Regional Steeplechase Finalist at AAC Regional Championships. Ranked Canada's #4 show Brittany in 2013, Boo is the is son of National Specialty Winner BISS Can/Mex/Int'l CH ATChC HuntersHeart Big Chief FDJ CDX RE CGC (who was Canada's top agility Brittany several years, and ranked top 5 in both obedience and show) x BPIG winner CH RedDevil's Fire Without Flame CD. Thank you to breeder/owner Joseph Pownall for letting Pepper stay with us a while and produce some amazing kids. They are a joy to live with, each and every day. ZZ is an orange and white female, born Sept. 22, 2017 (shown surrounded by brothers in the photo). She shows great promise as a bed bug detection candidate. We plan to breed ZZ, provided that she matures into a healthy, biddable working dog and passes hip and CERF eye certifications. Unfortunately we can't predict timing of heat cycles. The stud dog will be announced around the time of mating. Hunter's Heart breeds occasionally, striving for health, temperament and biddability. Sound, balanced structure leads to function, for healthy dogs with fewer injuries, even into old age. Our Brittanys have great noses, and are a pleasure to hunt over (we mostly find grouse in the foothills). Their eagerness to please helps make these Brittanys great companions for families who enjoy an active lifestyle. Please don't consider a Brittany unless you're searching for a high energy dog that loves to run, that will fit into your active lifestyle. Brittanys are not a good choice of pets for most families, since they are athletes requiring daily exercise. Without adequate exercise, Brittanys can misbehave, be destructive, and end up in Brittany rescue. These are high maintenance dogs that need a job to do, during hunting season, and every day of the year. Each puppy costs $1500 Cdn + tax. This is split into 2 payments: a $200 non refundable deposit is required to reserve your puppy, then the $1300 balance is due when pups reach 8 weeks of age. The price includes deworming, vaccination and health check by a vet, microchip, CKC registration papers and our written guarantee. We encourage families to pick up their puppy if at all possible. Canadians may be able to fly home with your puppy in a soft sherpa crate under your seat, if your puppy is small enough. Many puppies have traveled large distances and they generally do very well (with rare cases of car sickness). Hunter's Heart is renowned for extensive socialization. Litters are whelped in the bedroom and grow up in the living room, as part of our family. Even before the puppies ears are open, we fire a capgun before food and going for a run. This classical conditioning means that by the time that puppies go to their new homes, loud noises are either ignored, or a reason to come running in anticipation of something rewarding. Provided that owners transition to louder guns in the field, slowly and at decreasing distances, the puppies are off to a good start in accepting gunfire. Every litter is exposed to birds and scent. 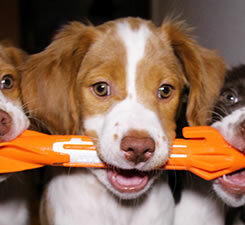 As early as 5 weeks of age, puppies start their scent detection training. We also work on retrieving, agility and balance. 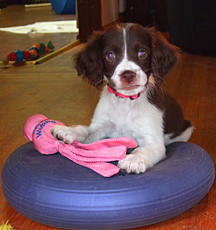 Puppies are matched with families based on temperament testing at 8 weeks of age. Please note that we cannot accommodate preferences for color, size or markings. Matches based on a cute appearance are far less likely to succeed in the long term. 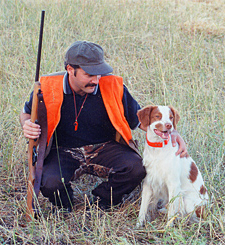 If you want a hunting dog, we'll match you with a bold pup who offers flash-points, excels at scent training and/or is highly motivated to retrieve. If you have young infants at home, we'll match you with a less active pup who enjoys spending time with children. As an all-breed Canine Good Neighbour Evaluator for the Canadian Kennel Club, and former Behavior Assessor at the Calgary Humane Society, Carla offers extensive experience evaluating good versus risky temperaments. Our puppies' temperaments are guaranteed in writing, as long as the owner completes the requirement of attending a 6-week puppy socialization class. A puppy is a lifetime commitment, for both families and the breeder. All puppy owners must sign a purchase contract, non breeding agreement, and paperwork from the Canadian Kennel Club. (Registration papers are included in the price.) Hunter's Heart will take back any dog we bred, at any age, for any reason. We give our puppies the very best start we can, but when you bring your puppy home you need to continue socializing and training to ensure (s)he is a joy to live with rather than a problem adult. Please note that we leave tails and dewclaws intact. We do not dock tails or remove dewclaws because these functional parts of the body help a dog to run, turn, climb out of icy waters, and balance best, for maximum performance and longevity. According to "Mastering Jumping Skills", "the tail helps with rear-end awareness, turning, jumping, balancing, accelerating, and braking. When the dog takes off for a jump, his tail is low; but as he crests the jump, his tail rises. This tail movement helps shift the dog's center of gravity and raises the dog's rear end to clear the jump. As the dog lands, the tail comes back down to help the dog find his balance.... Dewclaws add stability by digging into the ground as the leg rotates, especially when the dog is bearing weight on one front leg, as when he lands from a jump. Dogs without dewclaws will put more stress on their shoulders and spine when turning" (Linda Mecklenburg, DVM, 2015). While leaving tails and dewclaws intact supports optimal health and performance, our puppies are not eligible for conformation shows in Canada under current CKC rules. (They are eligible to compete in ALL field and performance events, and UKC and AKC conformation shows). If you prefer for your puppy to have a docked tail and dewclaws removed, please contact another breeder, as the majority of breeders in North America follow that traditional practice. The first step in reserving a puppy is to email Carla your completed screening form to learn more about your family's needs. Provided that both parties agree that a Brittany puppy is a good fit, the next step is to reserve a puppy by placing a non- refundable deposit. 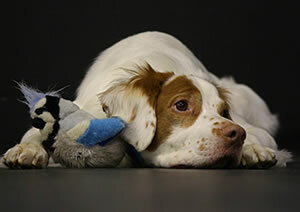 Thank you for considering Hunter's Heart Brittany Spaniels.